The Vail Child Development Center (TVCDC) is a ministry of The Vail Church led by a governing body including an Executive Director of the church staff team, a Board of Elders, and a Finance Committee. Our campus is located in the beautiful Colorado Rocky Mountains near the world-renowned Vail and Beaver Creek Ski Resorts. As a faith-based institution founded on biblical principles, TVCDC hires employees who agree with the school's mission and philosophy, statement of beliefs and biblical standards of conduct. TVCDC considers teaching candidates who are competent in Early Childhood Education best practices as well as passionate about and experienced in working with children. Qualified candidates must provide state documentation as proof of meeting Early Childhood Teacher requirements through the State of Colorado. It is preferred that candidates are regular attenders and involved with serving or teaching in a local church which is doctrinally aligned with TVC. TVCDC is seeking experienced substitute teachers and teacher assistants with flexible schedules for Early Childhood classrooms. 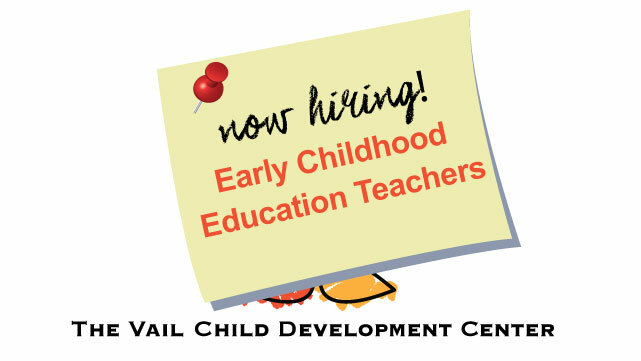 Candidates should possess or have the credentials to obtain an Early Childhood Teacher letter from the State of Colorado. All Substitutes must successfully pass all background/reference check requirements. If you would like to tour of our facility and/or learn more, contact the Admin office by phone or send an email today.